The Old School House Bar and Restaurant, a traditional but modern Irish pub. Our restaurant has been recently refurbished and we specialise in locally sourced steak and seafood. We have an extensive menu, with great early bird and daily specials available. Downstairs in the bar you can sit and enjoy a great pint of Guinness, watch all sporting events on our big screens, take in some live music, enjoy a burger or steak from our barfood menu or simply just sit outside in our beautiful all year round beer garden. Looking forward to returning for another great dinner. Service, food, drinks and atmosphere were amazing! Upon arrival gave my name to staff member.Was not brought to table we were just pointed in the direction of it. I asked twice where it was and eventually was brought to it. As it was for my son's confirmation was not impressed as to where we were put. We were under the stairwell I felt we were not belong to the pub. I asked could we be seated else where I was told there was confirmations in the other areas. This annoyed me as I had put on my booking it was for my son's confirmation. As the staff member was walking away muttered under her breath jesus. I didn't say anything as I wanted it to be a nice afternoon lunch for my son. I couldn't fault the food and the value for money. Service terrible. During the meal the waitress ask my friend if he finished eating where he still was eat, we all was in shock, on top of that we were inform tyhat we have to leave the table as is next reservation in 0.5h , thats the table is book only for max 2h- where is the information??? We meet in there to celebrate and we were pushed out. On top of that food so-so. Finaly we pay our bill and we went downstairs to the bar- food delicious, service perfect. So i donot recommend restaurant, but i do recomend the bar. The booking online should be improved where you can pick the restaurant or the bar. Good food, good service good atmosphere. Enough choice for everyone including fussy children. Great place to go for dinner with my family, quality of food very reliable, filling and tasty. We were unable to finish our second course. Booked a table of 5 here to celebrate my son's 18th. It was a brilliant night, excellent food and service. Staff were lovely and pulled out all the stops for him. We will be back again soon! The food was amazing and the staff were really friendly. I already have my next visit booked. Lovely restaurant with very sizeable food portions and fair prices. I enjoyed my time in the Schoolhouse and so did my partner. I will be recommending to friends. The best place in Swords for food and drinks. The staff are top class and very professional and friendly. Kate and the girls were great. The service was good and the waitresses are all friendly and attentive. The food as delicious. We were in on Sunday and everyone is still talking about how nice the food was. Fantastic value as well with the Sunday menu. Options for 2 or 3 courses. I got the prawns to start - so so good. And the chicken and mushroom pasta for mains. Will definitely be back soon! Meal was good but wouldn’t be rushing back and wouldn’t recommend it to a friend. Not nice to have to walk through beer garden to get to bar and restaurant. This is second time we celebrate family ocasion in Old School. All was perfect. Food is lovely. Staff very nice and friendly. Waiting time is ok. Good price for delicious food. Will be back definitly. The food in the bar is better than the restaurant. The Sunday menu isn’t great. There’s so much more choice in the bar. The food wasn’t hot. By the time we got a couple of bites it was cold. The restaurant bit is fairly small but it was louder than the bar. Excellent except a little expensive for a restaurant of that spacing & noise . Sunday Menu Lovely food at a good price and excellent service. Delicious food in a relaxed atmosphere with friendly attentive staff. Highly recommend! 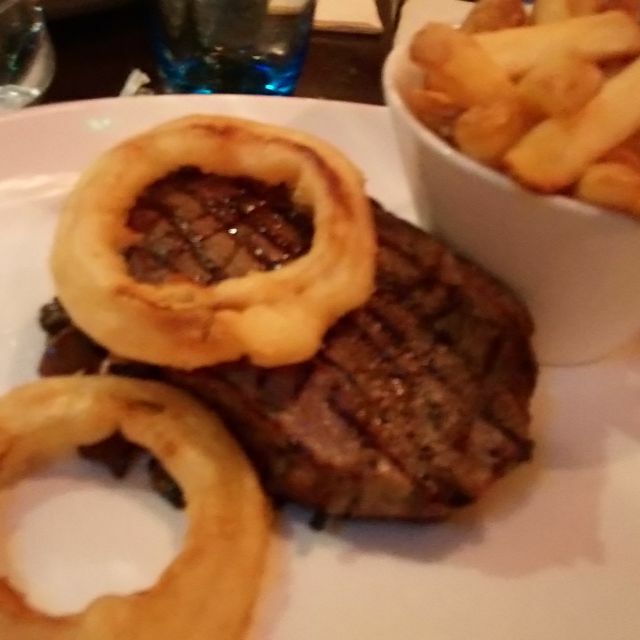 Our meal in the Old Schoolhouse was wonderful..The service was superb and we felt really at home atour lovely cosy table..The food was amazing especially our steaks which were superb ! The best meal I have had in 2018 ! Brilliant in every way , is still the best restaurant in swords. The staff are so professional and friendly. The service was very good. The staff were very pleasant and friendly. Food as always was delish..
Just a lovely atmospheric restaurant. Great service great atmosphere great menu and food. Highly recommended. Staff are excellent and food in restaurant is always fab. A great night out with an early bird Christmas meal . Great value decent sized portions and no waste . Excellent presentation of the food and very attentive staff . Food was very tasty but was not served hot. Mussels some were undercooked. As a diner I like to be asked throughout meal simple questions like 'is everything ok' , 'can I get you anything', which did not happen meaning each time we either had to get up or call a waiter. Food and service was fantastic couldn’t fault it in any way. Will definitely be back!! 10/10 food was absolutely perfect and so delicious!